Thanks to General Mills for sponsoring this post! 1. Make it snappy: With middle school starting a full hour earlier than elementary school, we had to overhaul our morning routine and prioritize speedy (but filling) breakfasts. 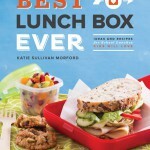 That meant hand-held meals like egg burritos and smoothies—and reminders to eat protein and fiber to keep bellies from rumbling during morning classes. 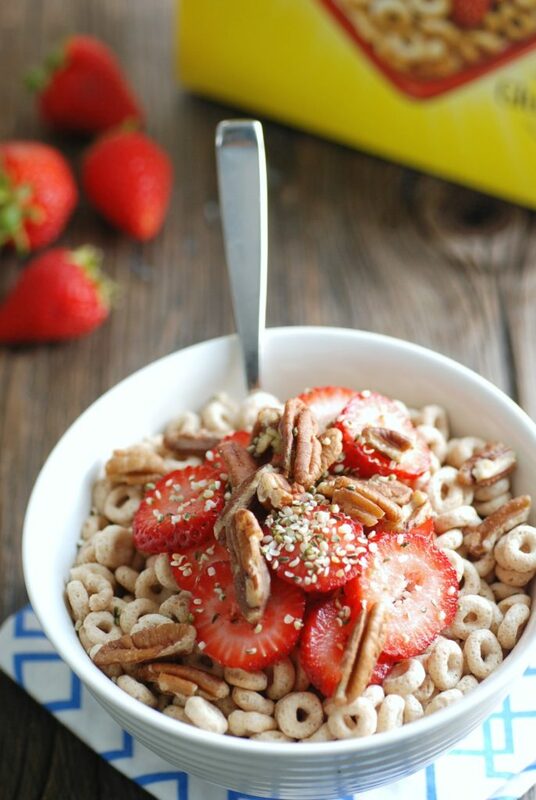 One of my favorite cereal tips: Start with original, low-sugar Cheerios and add nuts, seeds, and fruit. If you want more sweetness, top it with a teaspoon of sugar or honey. 2. Let them get junk food somewhere else: Because it’s out there—everywhere! And with new freedom and their own money in their pockets, they’ll find it. I don’t keep foods like soda and potato chips in the house because I know my son will occasionally get them, whether it’s at a friend’s house, at the movie theater, or from a vending machine. 3. 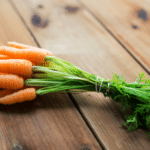 Make it count: I can’t control what my son eats when he’s out on his own, but I can make sure that what he gets at home is nutrient-rich when possible. Luckily, my son is also becoming more interested in learning about nutrition—how different foods and nutrients affect his mood and energy level and even how to read food labels. And he’s making more of his own food too. The smoothie bowl trend is a fun way to cram in lots of nutrients and let kids take charge by adding their favorite toppings. 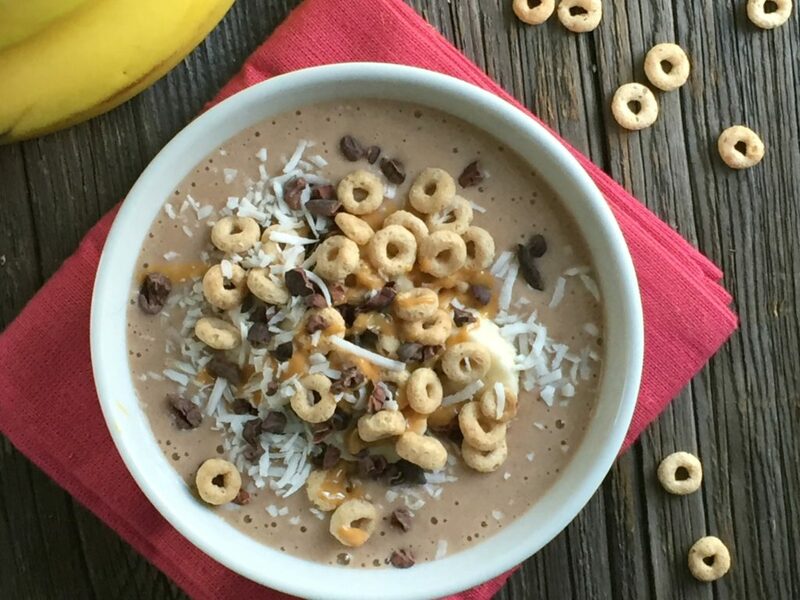 Get the recipe for a Chocolate Peanut Butter Cereal Smoothie Bowl below! 4. Keep an eye on calcium: The sad reality is that it’s all too common for soda and other sugary drinks to displace milk as kids get older. But children ages 9-13 need 1,300 milligrams of calcium a day—that’s a full glass of milk more than they needed before. My son isn’t the biggest fan of straight-up milk, so I make sure he gets yogurt in his lunchbox, milk in smoothies, cheese at snack time, broccoli with dinner, plus fortified foods and drinks like soy milk, orange juice, and even cereal (each cup of Cheerios has 100 milligrams of added calcium—plus other nutrients kids need like vitamin D and iron). 5. 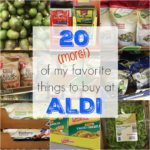 Pack snacks: Shifting schedules and changing appetite means I’m never sure how much food my son will need when he sets off in the morning. 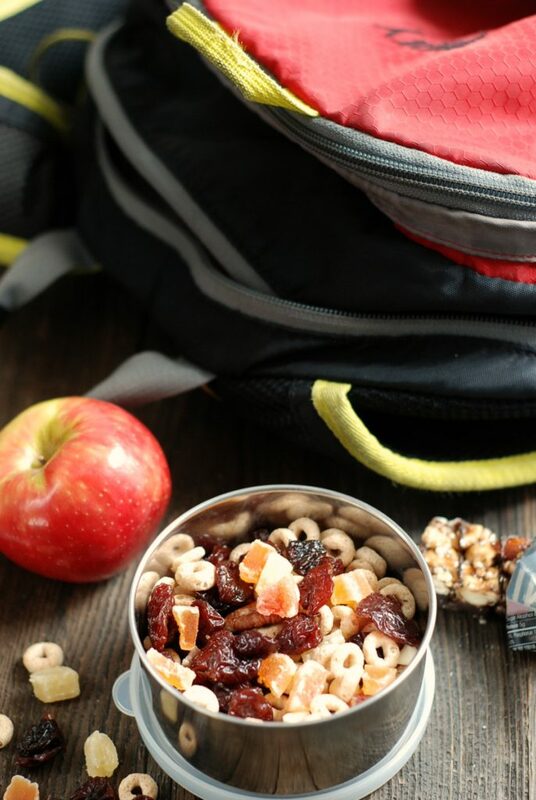 So I tuck some easy packaged snacks in a compartment of his backpack, like granola bars, bags of nuts, boxes of raisins, and homemade trail mix—which you can toss together from whatever odds and ends you have in the cabinet: dried fruit, pieces of whole grain cereal, nuts, seeds, chocolate chips, and pretzels. 6. Cook. Reheat. Repeat: With kids dashing in and out from clubs and sports and friends’ houses, it’s smart to double recipes for leftovers or freezer meals (like these Freezer-Friendly Beef Burritos) and lean on slow cooker dishes that can be held on “warm” and served in shifts (like this Slow Cooker Turkey Taco Meat). 7. Don’t write off family dinner: It can feel like our tweens and teens don’t need us anymore and that they’d much rather be hanging with their friends than home with the fam. But family dinner still matters—in fact, as older kids are navigating tricky social situations and sometimes-stressful decisions, they probably need that stability and security more than ever. 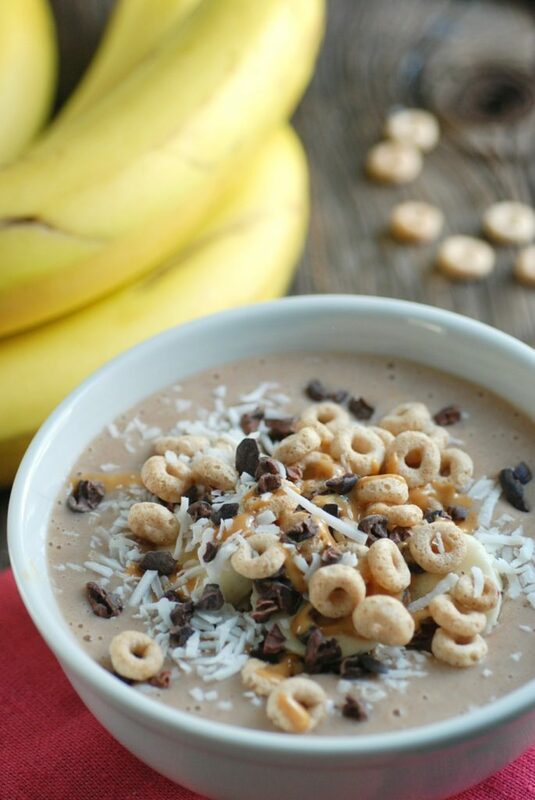 Pour into a bowl and top with unsweetened shredded coconut, cacao nibs or mini chocolate chips, Cheerios, sliced banana, and a drizzle of natural peanut butter. I’m happy to be patterning with General Mills Cereals for this back to school post. General Mills is on a mission to make their cereals simpler and even better. More than 90 percent of their cereals are now made without artificial flavors and colors from artificial sources. Question..do you blend the 1/2 cup of Cheerios in the blender? Or are they a topping only? It says “all ingredients” – so I wanted to check. Thanks! Great tips! I don’t have tweens or even teens yet but those days aren’t far off. And this smoothie bowl looks delicious! Cheerios are a household staple for us too. 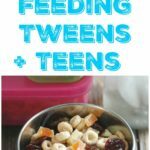 I have at least a few more years until we hit the tweens, but these tips are great and will come in handy as I have less and less control over what my kids eat. Plus that smoothie bowl looks amazing! Great post – have you figured out a way to make egg burritos or sandwiches ahead of time? Weekday mornings are just so crazy for us trying to get everyone out the door. Thanks! Hi Amy–I have experimented with doing egg sandwiches in the freezer. They’re not bad (obviously not as good as fresh) but I’ve found out that my kids don’t like English muffins. 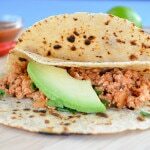 So I need to try them in tortillas or another bread next time.